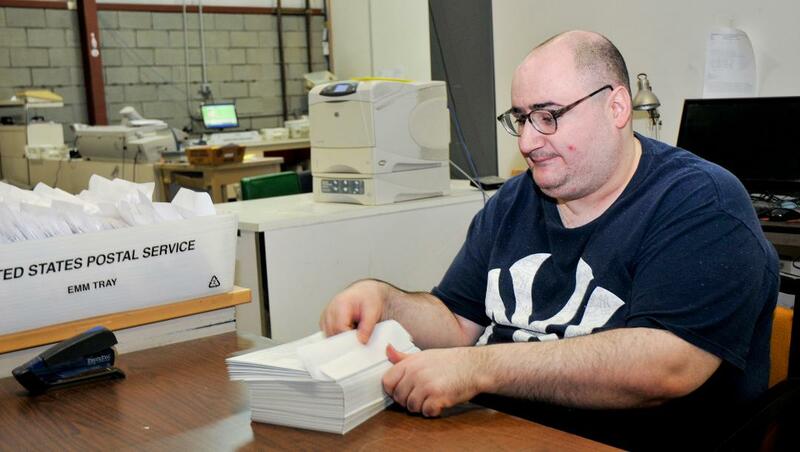 Jobs Create Multiple Benefits as NYSID CEO Maureen O'Brien Sees Firsthand at Center for Disability Services - New York State Industries for the Disabled, Inc.
Joseph Scorza (pictured above) loves the New York Yankees, loves boxing and weight lifting -- and he loves his job as a mail processing clerk at the Center For Disability Services' Mail Fulfillment Center in Albany. Maureen O'Brien, NYSID president & CEO, toured the facility on September 25 and met several individuals with disabilities who work on Preferred Source contracts. During her visit, she also spoke with the Times Union about the importance of New York State's Preferred Source Program and the benefits of employing individuals with disabilities -- 70 percent of whom are unemployed statewide. "A job means money, independence, but you can see the social impact here as well," O'Brien said. "Workers chat with each other about their lives and homes and where they live." Overall, the Center employs 147 workers between its Pearl Street and Karner Road locations. Of these, 127 are individuals with disabilities. In terms of mail fulfillment, 76 workers -- 48 of whom have disabilities -- process 200,000 to 250,000 pieces of mail daily, according to Chris Schelin, mail fulfillment operations director. The mail workers are divided into small groups who manually gather forms and pages each envelope should contain, then address, seal and sort them. Among these workers with disabilities is Richard Whaley. Rich and Joe -- both of whom were Joslin Outstanding Performers -- received special recognition at NYSID's 2016 Annual Meeting for advocating toward keeping these job choices and bringing to life the importance of their jobs for themselves, their families and their community. They had testified at a NYS Procurement Council meeting about their mail processing jobs. O'Brien noted how workers with disabilities often feel isolated from the world outside their homes "which makes the social aspect of work so important." In speaking with the Times Union, O'Brien praised New York's Preferred Source Program, which advances specific social and economic goals related to the employment of New Yorkers with disabilities. As a facilitating agency of the Program, NYSID empowers people with disabilities through approved Preferred Source job opportunities provided by its statewide membership. Its member agencies can also partner with private sector New York State businesses, including Minority and Woman-Owned Business Enterprises and Service-Disabled Veteran Owned Businesses. NYSID is proud of its role in this successful program -- in collaboration with the NYS Education Department (ACCES-VR), NYS Office of General Services, Office of the NYS Comptroller, and NYS Attorney General -- and the thousands of lives touched in the process.